"Our Holy Father Patapius was born and brought up in the Faith and in the fear of God by pious parents in the Egyptian city of Thebes [in the 7th Century] He perceived and rejected the empty vanity of the world early in life and went into the Egyptian desert, where he devoted himself to cleansing his heart from every worldly thought and desire for the sake of divine love. When his virtues became known among the people, they began to come to him and seek relief from their troubles. 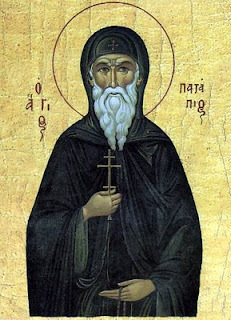 Afraid of human glory, which darkens a man's mind and separates it from God, Patapius fled from the desert to Constantinople, for this wonderful saint thought that he could more easily hide himself from men in the heart of a city than in the desert. He built himself a hut close to the Blachernae church and there, enclosed and unknown, took up again his interrupted life of asceticism. But the light cannot be hidden. A child, blind from birth, was led by divine Providence to St Patapius and begged him to offer a prayer that he might be given his sight and look upon God's creation, and praise God all the more. Patapius had pity on the suffering child and prayed to God, and the child saw. Through this miracle, Patapius's godly life became known throughout the entire capital, and people began to turn to him for healing, comfort and teaching. Patapius healed one eminent man of dropsy [edema] after blessing him with a cross and anointing him with oil. Making the sign of the Cross in the air, he freed a youth from an unclean spirit which had cruelly tormented him, and the evil spirit went out of God's creature like smoke, uttering a great cry. He made the sign of the Cross over a woman who had sores on her breasts all filled with worms, and she was healed. St Patapius worked many other miracles, all through prayer in the name or Christ and by the power of the Cross."